After Wednesday's decision by FIFA to award the 2026 World Cup to co-hosts Canada, the United States and Mexico, there's suddenly optimism and excitement (and a lot of work ahead) for a country that hasn't played in soccer's biggest event since 1986. For far too many years, the future of Canada's men's national soccer program has seemed bleak and without hope. But one announcement has changed that. 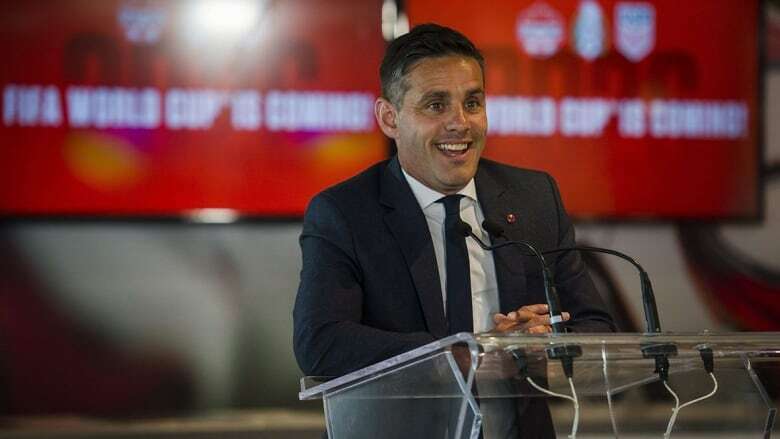 After the news came down from Russia, John Herdman, the coach of Canada's national men's team, couldn't stop smiling as he addressed the media members packed into a room at Toronto's BMO Field, which is slated to host World Cup matches in 2026. His energy and exuberance were palpable. "It's officially football Christmas for Canada," Herdman said, beaming. "What a feeling for everyone in this country." There are still many questions related to Canada's role in the joint hosting arrangement — including whether the Canadian team will be guaranteed a spot in the tournament (host countries typically get one, but this is the first time there will be three hosts). Herdman, though, sees this moment as a turning point for the culture of men's soccer in the country. "I think the biggest gift this World Cup gives to Canadian players is a genuine reason to stay and play in your own World Cup," he said. If FIFA, as expected, grants Canada a berth, Herdman wants his team to be competitive. "We just don't want to go into the 2026 World Cup and participate. We want to win at it," he said. "No one wants the team to play the odd game and say it was nice we were there." Herdman knows it's a tall task to get Canada's men's national program up to speed, but he's ready to take on the challenge, buoyed by this massive opportunity that awaits. While he doesn't know what the exact makeup of his team will look like, Herdman knows there are young players across Canada today who will begin to imagine their soccer futures differently. "That's what this country has been missing. It's been missing a reason and purpose to really want to put on that jersey. People have used it as a stepping stone in the past to further their careers and leave, but to stand in front of your own country and play in the World Cup changes everything." Herdman thinks eight years is more than enough time to build a competitive team, and said his focus at the moment is helping Canada qualify for the 2022 World Cup in Qatar. "We have a genuine opportunity to actually lay a foundation for 2026," he said. "That's where my effort is at this stage." It was just a few months ago that Herdman left his post as the Canadian women's national team coach to take over the men's side. His task remains restoring belief in a program that hasn't qualified for a World Cup in decades. "When I was a youngster the 1986 World Cup is what flipped the switch for me," Herdman said. "I just ask every Canadian to unite around this one opportunity. It's a once-in-a-lifetime thing. It's coming. It's time." Jason de Vos, the Director of Development for Canada Soccer, said hosting a World Cup will give an entire generation of soccer players in this country an incentive unlike anything before. "It's an incredibly powerful motivating factor," he said. "I would say it's a dream come true." He recalls growing up in London, Ont., playing both hockey and soccer and trying to imagine a future in the sport with the more modest profile of the two in Canada. But seeing the '86 team play in the World Cup helped steered him toward the beautiful game. "I would watch the games and imagine myself lifting the trophy, as unrealistic as that seemed," de Vos said. De Vos ended up choosing soccer and had a lengthy career, including competing for Canada's national team. He never realized that World Cup dream as a player, but he now has the opportunity to help assemble a Canadian team to compete at a home World Cup in 2026. "The players have a big role in determining the culture moving forward. We want to have players who desperately want to wear the maple leaf," he said. "For many years we've had opposing forces working against each other in grassroots soccer in this country, and now we have an opportunity to rally around the Canadian flag."